A new report has revealed that 2/3 of victims who reported to iReport.ie won’t report an incident to Gardaí due to a lack of confidence. “The fact that people are willing to report to us shows that there is a willingness for people to do something about racism” said Shane O’Curry, Director of ENAR Ireland, and one of the authors of the report. “However, our findings also show that there have been failings in An Garda Síochana’s capacity to follow-up. This may explain people’s reluctance to report to the guards. In this context, the announcement by Minister Shatter that An Garda Síochana is recruiting 300 new members presents an ideal opportunity to address one aspect of Garda-minority relations. If 100 of those new recruits were from Traveller, Muslim, Black, Asian, Roma and other minority backgrounds, then we would be on the road to having a police force that reflects the diversity in wider society. This would be a starting point to making all communities feel safe” he said. 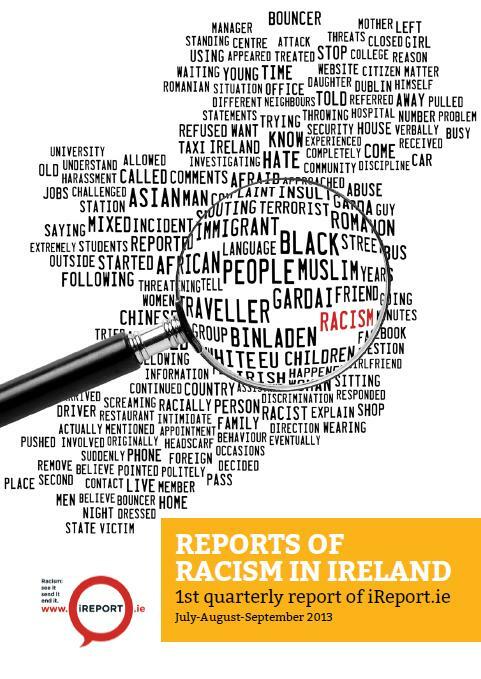 The iReport, the first Quarterly Report of iReport.ie, launched today by the European Network Against Racism In Ireland (ENAR Ireland) also found that Black Africans, Irish Travellers, Muslims, Roma, Asians, White Migrants and Irish people belonging to ethnic and religious minorities are all targets of racism. Since its launch on July 11th this year, iReport.ie has logged more than one incident per day. “I would like to commend all involved in the production of this robust and comprehensive report which indicates very well the diversity of groups experiencing racism in Ireland – some who are new, some who are part of Ireland always. In particular the people who have been prepared to share the incidents and the crimes they experienced or witnessed, are playing an important role in making Ireland racism free. ENAR Ireland’s work on iReport.ie is of value not only for documenting racism in Ireland but also for pointing the way to policy and legislative gaps and issues. It can be a useful tool for others globally struggling with similar issues”. * Black Africans are the most likely to be victims of public racism. * Most perpetrators are male. * The commonest reports are of shouting and verbal harassment. * Most incidents occur during the day. * Men are most likely to suffer violent attacks. * Men and women suffer different patterns of racism. * Muslim women are targeted because of their veils. * Nearly half of reports are made by witnesses or third parties. * A number of reports of spitting were made. * Racist incidents are have wider impacts on individuals, on relationships and on wider society. * A number of incidents of secondary victimisation were recorded. * Over 10% of reported incidents were directed at Travellers. ~ iReport.ie and the iReport are managed by ENAR Ireland, which coordinates a network of over 30 civil society organisations in Ireland working in anti-racism. ENAR Ireland is the Irish Coordination of ENAR, the European Network Against Racism. ENAR Ireland and ENAR work to coordinate common civil society led responses to racism and racial discrimination at a local, national and European level. ENAR Ireland used to be called INAR, the Irish Network Against Racism. ~ To ensure the analysis of the iReport reporting system is in line with robust international standards of data collection and analysis ENAR Ireland has partnered with Dr Lucy Michael, Lecturer in Criminology at the University of Hull. Dr Michael is an authority on hate crime recording systems and on the impact of hate crimes on communities. She is the author of several works in the area including ‘Hate Crimes against Students’ (2013) and ‘Securing civic relations in the multicultural city’ (2009). She is a member of the British Society of Criminology and an Executive Committee member of the Sociological Association of Ireland.